Power baser and double evil look great together. Looking forward to MMC Thunderclash/Wing and the GCreation Prowl! Are the Superion and Computron together the upgraded KOs or new upgrade setsfor the HasTak figures? Dammit! I wanted to see some progress from Zeta on their Bruticus and Superion. Dammit to hell. I still don't like FansHobby's Super Ginrai at all, but their Overlord looks great (except for the leg kibble, but oh well). I might buy Overlord. MMC with a Cliffjumper is interesting. It looks a bit small, but then again, Omne is about the same size as Klaatu, and Klaatu is quite large in alt mode, so... maybe he's the right size. I really dig MMC's Springer too, though he seems quite similar to Big Spring visually, so I'm wondering if it'll be worth double-dipping if you already have Big Spring (but if it turns out well, I just might because it looks like you can put a pilot in the cockpit). And then there are those Planet-X figures which just look incredible, especially Apocalypse. Seeing Megatron and Ultra Magnus coming together are nice too, as well as the Omega Sentinel. 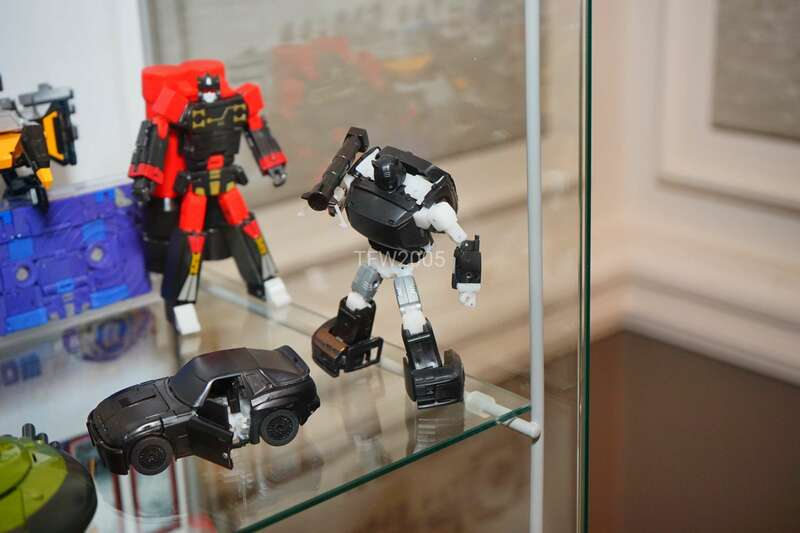 GCreations' Prowl looks great. Hopefully the quality is good. I'm really not feeling the chrome on Thunder Manus but I'm not going to be buying him anyway, so hopefully those who are like their chrome. Oh, and the other one I wanted to mention was KFC's Octane. Sure, we've seen it before but damn, that thing is beautiful. I really hope they nail the QC on that because I want one if it turns out well. We haven't had the third-party panel yet, to my knowledge, so I'm sure we'll see something soon. That, and Zeta has been showing off a lot of tidbits for Swindle and Brawl over the past week. DSC00053 - looks like a TR Overlord upgrade kit? I see FT Springer is still pea soup green on the face and limbs. I had hoped that would be corrected. That Kup is perfect though. I saw the Iron Factory thumbnail and got excited about that. Hopefully the come out after the panel. Which picture has a Cliffjumper? I totally missed that twice now. EDIT Oh ok I see it. To be fair, both of them are on display. FIRRIB, end of story, I win.